In a gallery at The Metropolitan Museum of Art Henry (Francis Guinan) guards Rembrandt’s Aristotle Contemplating a Bust of Homer. If it really depicts Aristotle at all. Henry is partial to the argument Rembrandt may have substituted the Greek painter Apelles in the philosopher’s place as an affront to the wealthy Italian who commissioned it. Were artists the true philosophers in Rembrandt’s opinion? For Henry, a scholarly man who has spent his life studying paintings and loving a poet, this seems about right. So begins Jessica Dickey’s funny and touching play, The Rembrandt, now enjoying its Chicago premiere at Steppenwolf Theatre in an elegantly designed production directed by Hallie Gordon. A retired boarding school art history teacher, Henry delights in spending his days in proximity to great masterpieces. But lately he’s been using work to avoid being at home with his dying poet husband, Simon (John Mahoney). His work buddy Jonny (Gabriel Ruiz), an Iraq war veteran who presumably knows a thing or two about loss, calls him out on his avoidance and urges Henry to go home and care for Simon during what little time they have left. But Henry can’t face home, crippled by guilt he has somehow failed his beloved. Not because of any dramatic transgression or disloyalty, but simply through the commonplace faults of not being quite present enough, patient enough or kind enough. In this way, Henry tortures himself with his own private standards of perfection feeling forever undeserving of the love he has received. The Rembrandt is an idea driven play and the story arc is an emotional one. Dickey boldly writes “on the line” so to speak giving her characters license to say precisely what’s on their mind. Minutes into the first scene Madeline (Karen Rodriguez) a copyist who has come to paint the Rembrandt plainly tells the new guard, Dodger (Ty Olwin) she’s hoping painting will be a salve for her grief. But just as we’ve settled in for a play about four sensitive souls discussing art, mortality and alienation, Dickey dispenses with all pretense of naturalism and takes us on a Stoppardian timehop slash existential dream sequence into Henry’s idea of Rembrandt. What follows is a sincere, if at moments awkward, meditation on the terrifying prospect of surviving the person you love most. And, although some of the conversations in the middle section of the play are a bit on the nose and rather exposition heavy in places, overall Dickey’s experiment is a worthy one. The comedy keeps the play flowing and the characters’ sincerity keeps the audience emotionally engaged. Design elements, such as a detailed set with moving walls by Regina Garcia, help link the play’s several worlds. Key props appear in different scenes hinting that perhaps much of the story lives in Henry’s imagination. In the end we land perhaps not where we’d necessarily expect to be but certainly right where the playwright wants us to be. Gordon’s cast is filled with familiar faces. It’s always a pleasure to see Steppenwolf ensemble member John Mahoney and, without giving too much of the story away, it’s a delight to see him play a touching love scene opposite Guinan. Gabriel Ruiz, with his dead-on comic timing, is endlessly charming. And Karen Rodriguez, with her trademark droll wit, nails Madeline. Another joy of this play is that it’s full of loving, sensitive male characters. Ty Olwin’s Dodger leads with his nurturing side when wooing Madeline and scores points by proving helpful and understanding. Ruiz plays two characters who are kind and caring, one a gun toting security guard and the other in-home nurse. 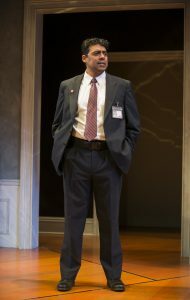 And Francis Guinan, perhaps the most utilized actor in the ensemble (he’s appeared in over thirty Steppenwolf shows), is well-suited to the part of Henry, whom he plays as a gentleman with exacting standards who is far from stuffy. The play’s cascading moments of recognition accumulate into a quiet epiphany. The story never erupts so much as assertively reveals. In many ways The Rembrandt accomplishes what Henry believes a good portrait should. It minimizes distraction while drawing attention to its subject, thereby showing us a new way of seeing something familiar. It may not be perfect but, just as the mismatched hands of Aristotle in Rembrandt’s portrait don’t detract from the painting’s beauty, but add to its complexity, the play’s missteps are hardly significant in comparison to its many successes. 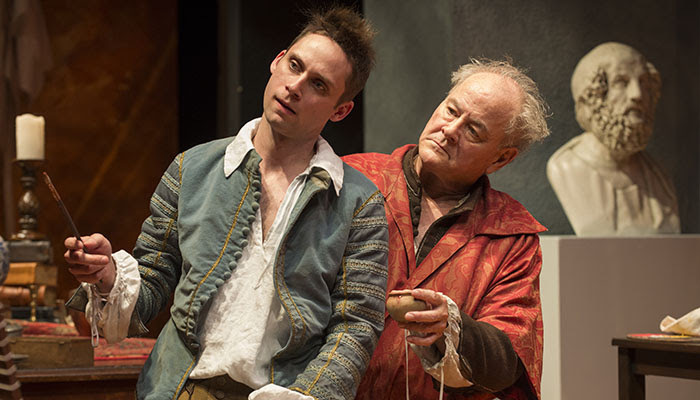 The Rembrandt is an inventive and thoughtfully composed play, compelling for its depth and substance and notable for its bold experiment with form. Bias Alert: Rescripted Founder/Editor in Chief Regina Victor is serving as Steppenwolf’s 17/18 Artistic Apprentice/Multicultural Fellow. A Note About Names: This play is directed by Hallie Gordon and my maiden name also happens to be Hallie Gordon. Before I got married and changed my name to Palladino people often confused us. I’ve never actually met the other Hallie although I’ve been to her plays. It’s gotten better with my new name but I still occasionally get her emails and phone calls. I am, however, not her.